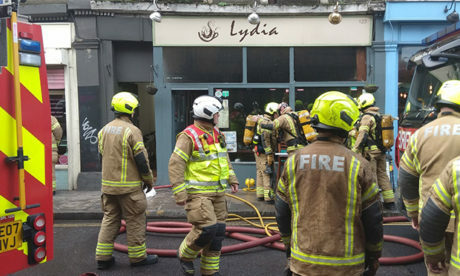 A chef escaped serious injury yesterday when trying to put out a blaze in a deep fat fryer at Lydia Café in Stoke Newington – prompting advice from the London Fire Brigade never to use water to tackle oil-based fires. Two members of staff in the café and two residents in the flats above managed to flee the building on Church Street before help arrived, with one man treated at the scene for smoke inhalation. Six fire engines and around 40 firefighters had the blaze under control by 1.12pm – an hour and a half after the initial call came in. Part of the basement and a small part of the ground floor were damaged by the fire, which is believed to be accidental. Lydia Café thanked well-wishers on its Facebook page, confirming that no-one was hurt and that it will be “closed for a while until we fix the damage”.